→ Report Prunus laurocerasus to the National Museum of Natural History. The Department of Ecology of MNHNL has launched a citizen science survey with children who are member of the of the Panda-Club of the Luxembourg National Museum of Natural History. An article in the children magazine Panewippchen (Schaltz 2017) suggests the young readers to participate to a citizen science survey concerning the recent spread into the wild of the cherry laurel (Prunus laurocerasus L.). Interested children are asked to look into the forests in their neighbourhood, the evergreen cherry laurel being very easy to spot in winter time, when trees and shrubs rejected their leaves. Distribution map of Prunus laurocerasus L. in Luxembourg. Recorder database, MNHNL, 20.04.2019. In Luxembourg, cherry laurel is a common garden plant, mostly planted to build hedges. The first documented occurrence of the species in Luxembourg dates from 1952. It was found by Adolphe Molitor in Höhenhof, municipality of Luxembourg (Herbarium specimen). 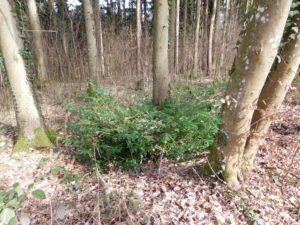 Since 2016, the plant was discovered in forest areas west of Steinsel, between Steinsel and Bridel, in Bereldange, close to the natural reserve Haard – Hesselsbierg – Staebierg next to Dudelange, near Cruchten (Krippel et al. 2018: 70). Since then, further locations have been found which suggest that the species is expanding into the wild (e.g. Findel, Remich). 21 observations are currently documented in the Recorder database (25/09/2018). A similar behaviour can be observed in neighbouring Belgium (Henneresse 2014). Cherry laurel is a shrub that thrives in woodland areas with moist, slightly acidic soils, both in well-lit and shaded conditions. Fruits are dispersed over long distances by birds. In recent years, seedlings have increasingly been observed in the wild (Source: http://ias.biodiversity.be/species/show/112). ISEIA protocol: C1 (2+2+0+1) (Ries et al. 2013: 18). Henneresse, T., 2014. Notes floristiques inédites sur la Lorraine belge et l’Ardenne méridionale (2009–2013). Adoxa 81: 29-40. Prunus laurocerasus near the natural reserve Haard – Hesselsbierg – Staebierg, Dudelange. Photos by Tiago de Sousa (ANF), 15 March 2017. Ries, C. & M. Pfeiffenschneider (Eds. ), 2019. Prunus laurocerasus L. In: neobiota.lu - Invasive Alien Species in Luxembourg. URL: https://neobiota.lu/prunus-laurocerasus/ [20.04.2019]. Last updated on Thursday, December 6, 2018. ← Previous Previous post: Rhus typhina L.
Next → Next post: Mahonia aquifolium (Pursh) Nutt.